“Imagining in Excited Reverie: Sidney Nolan, a Centenary Tribute”. The painting is Nolan’s 1948 “Orphée”, collection NGA. In 1965 Sidney Nolan was invited to paint the cover for a centenary tribute to W. B. Yeats. 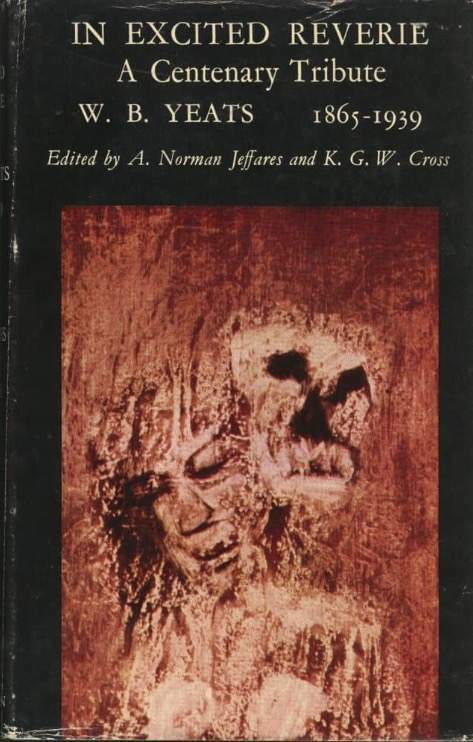 It is one of almost eighty Nolan book covers. The book’s title In Excited Reverie, is from a Yeats poem. 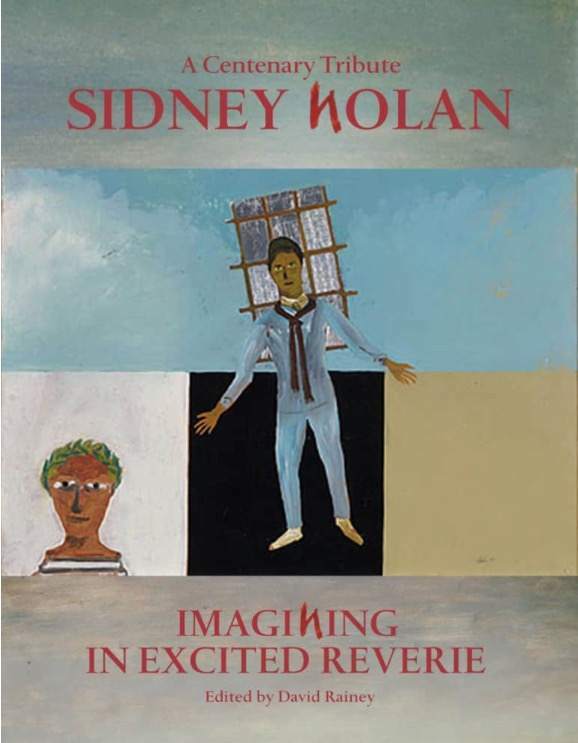 Imagining in Excited Reverie is an online collection of prose and poetry in tribute to Nolan. Contributions have been sourced widely, within Australia and beyond, and come from acknowledged experts as well as relative newcomers to his art. All examine the author’s personal involvement with either Nolan or his work, and how it informs their view of this best known Australian painter of the 20th century. Contributors were invited to look at Nolan’s life and work from their own perspective – whether curating in excited reverie, filming in excited reverie, visiting, living, loving, discovering, collecting, writing, wandering, wondering in excited reverie, and so on. To slightly modify the foreword to the Yeats centenary tribute, the essays explore aspects of the thoughts and ideas, the background, the reading and the painting, the activity and the personality of the painter as well as the reactions of others to his life and work. They are offered as a tribute to the achievement of that life and work. Essayists include directors, curators, art historians, writers, artistic collaborators, other artists, collectors, gallerists, family and friends. Their contributions will appear regularly throughout 2017. Synopses of these essays, and links to them, follow in order of posting. Mirka Mora arrived in Australia the year after Nolan left. Artist and restaurateur, Parisian-born Mirka and gallerist husband Georges were in the vanguard of a band of post-war European émigrés who transformed Melbourne’s avant-garde and Bohemia during the 1950s and 60s. She did not meet Nolan until 1978. Here, almost 40 years later, she recalls that meeting. Randolph Stow and Sidney Nolan collaborated in the 1962 publication of Outrider, Stow’s poems written 1956-1962 and illustrated by Nolan. The two Australians found an affinity and their friendship lasted 30 years. One of the poems was written for Nolan and is included here as Stow’s tribute to his friend. Brian Adams wrote Nolan’s first biography in 1987, and knew and admired the artist, both professionally and socially, for 35 years. His tribute sets the Sidney Nolan he knew somewhat at odds with the art world of 2017, and contrasts today’s view of Nolan in both Australia and Britain, 25 years on from his death, with Nolan’s own imaginings of his art’s legacy. Judith White, Arts writer and former executive director of the Art Gallery Society of NSW and author of two books: Culture Heist: Art versus Money Brandl & Schlesinger 2017, and Art Lovers: The Story of the Art Gallery Society of New South Wales 1953-2013 AGSNSW 2013, explores landscape in the paint of Sidney Nolan and the pen of Randolph Stow, and in the excited reverie of their imaginative minds. Felicity St. John Moore met Nolan in 1980 when he gifted to Australia a fine selection of his early Kelly paintings. Speaking of Danila Vassilieff and the influence he had on young artists in Melbourne in the 1940s, Nolan admitted that his stay at Vassilieff’s house Stonygrad in 1946 was pivotal to First Class Marksman – to this day the outlier among the first series Kellys. He would not explain further and challenged her to discover trigger and key. In this tribute we learn of her discoveries. Simon Pierse grew up in London and first came across the work of Sidney Nolan in the early 1970s when, as a school boy, his art teacher showed him the 1961 Clark/MacInnes/Robertson monograph. Author of Australian art and artists in London 1950-1965: an antipodean summer (Ashgate 2012), his tribute takes another look at Nolan’s art-making and universality through a lens of British perception, augmented by the writing of Cynthia Nolan. David Rainey edits this and the aCOMMENT websites. His interest in Sidney Nolan overtook an earlier search for Ern Malley when he co-curated the exhibition Ern Malley: The Hoax and Beyond at Heide Museum of Modern Art in 2009. His tribute is a work of the imagination and takes the form of an imaginary text supposedly written by Sidney Nolan himself, and of course not found among his papers after he died on 28 November 1992. It is posted here on the 25th anniversary of his death. The line is in the second stanza of Yeats’ poem A Prayer for my Daughter.